This is part of NRN’s special coverage of the 2017 NRA Show, being held in Chicago, May 20-23. Visit NRN.com for the latest coverage from the show, plus follow us on Twitter and Facebook. 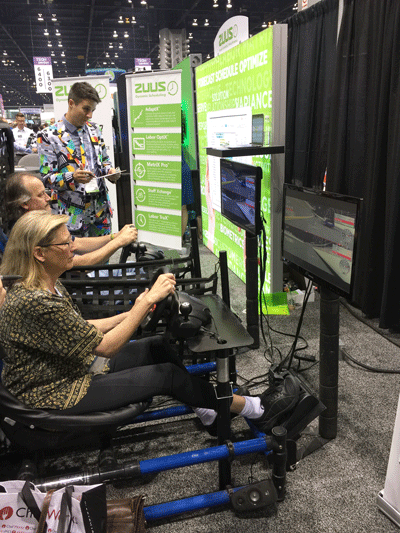 Scheduling, delivery and automation were key topics at tech exhibits at the NRA Show, particularly for operators looking to trim labor costs and improve efficiency. • Delivery and takeout marketplace Grubhub announced an integration with point-of-sale provider Oracle Hospitality that allows restaurants to manage in-house, delivery and takeout orders from one device. The integration removes a common pain point. Previously, staffers manually put Grubhub orders into the POS system, which took time and left room for error. With the integration, Grubhub’s website and apps will also have automatic access to menu updates and pricing changes, and financial information will be consolidated, eliminating the need for staff to juggle information from multiple devices. The integration includes users of the Breadcrumb POS by Upserve and Toast. • As a result, Toast introduced new takeout and delivery features, as well as a free food-cost calculator that can help operators know what to put on their menu with data from other restaurants in the area and pricing. • OpenSimSim unveiled a free, cloud-based scheduling tool that allows real-time notifications to workers’ mobile devices, a template for easy schedule creation, and message board and chat capabilities. Workers can update availability, ask for time off, swap shifts or apply for extra hours. The scheduler has been beta tested in the San Diego restaurants Urge American Gastropub and Pardon My French Bar & Kitchen. • Noodoe showed off its tableside service block, with five customizable calls to action. Guests can flip the block to the icon facing up to, say, call their server, or ask for water or the check. The block sends a wireless signal to a digital wristband worn by the server. The wristband vibrates and lets the server know what the guests need and at which table. The Noodoe block can also be used in the kitchen to allow line cooks to call food runners when a plate is ready. It’s also good for private dining or out-of-the-way tables, said Steve Kuo, Noodoe’s vice president of business development. The service block is in use at the California restaurants Cicciotti’s and Bub’s At The Ballpark. • OpenTable has joined forces with QSR Automation’s DineTime to allow guests to book reservations or get on the waiting list for casual-dining restaurants. OpenTable offers reservations for more than 42,000 restaurants around the world, including many high-end concepts, while QSR Automations is a kitchen and restaurant management platform for about 80 percent of the largest casual-dining chains. With the partnership, guests can use OpenTable to estimate wait times and add their names to waitlists. Startup Alley has more interactive exhibits with video games, ping pong and beer pong. 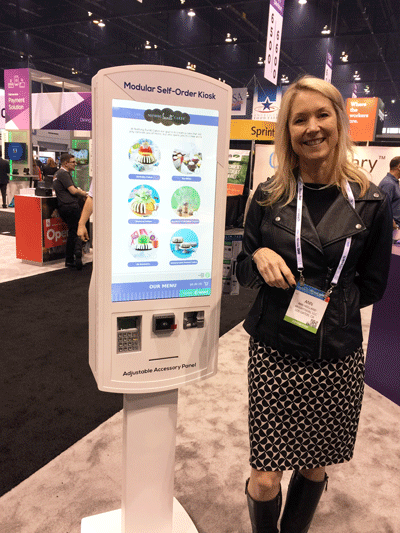 • Digital signage specialist BrightSign debuted a new self-service kiosk, developed in partnership with Felbro Displays. 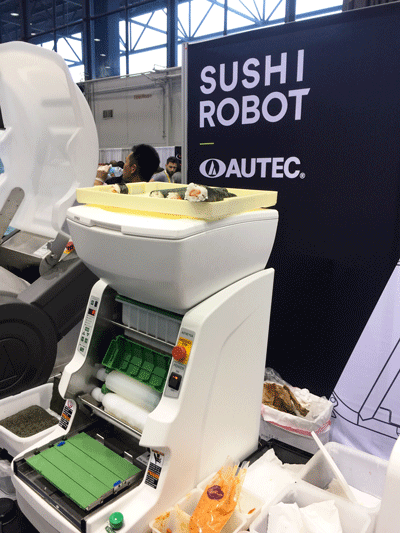 • Autec displayed several models of its sushi robot, a machine of sorts that can make 400 sushi rolls in an hour. Humans must insert the seaweed and the machine rolls out a perfect layer of rice. The human adds the filling — fish and wasabi — and the robot rolls it into a perfect sushi roll. Another machine cuts the roll into bite-sized pieces. • Zuus has been known for automated scheduling in the quick-service segment, but this year they’re moving into full-service restaurants, offering a labor management program that shows labor and corresponding sales hour by hour throughout a shift, or even down to 15-minute increments. The platform is compatible with NCR, Toast, Micros and Revel systems. Correction: May 22, 2017 An earlier version of this story misspelled Zuus. It has been updated. An earlier version of this story misstated Steve Kuo's title. He is vice president of business development for Noodoe.